"Give it a go... you never know what hidden talent you may reveal"
Drapers Mills Primary Academy aims to teach pupils, through experience, to know and value the benefits of participation in physical activities. They learn to plan, to improve and to evaluate their own performance and that of others. 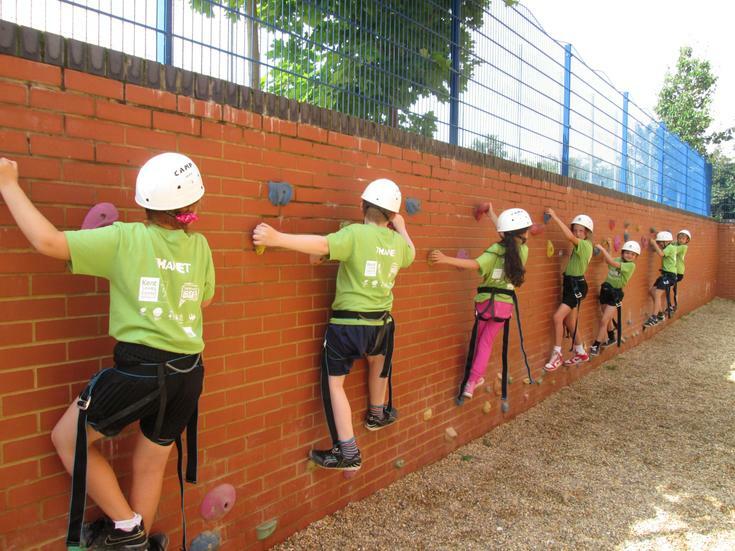 Children are given the opportunity to learn safely how to develop strength, endurance and control of their bodies through carefully structured challenges. All children follow a balanced programme of study for gymnastics, dance and games in all years with the addition of swimming in year 6. With the government having spent approximately £10 billion on the 2012 Olympic Games, it was only right that the Games would not only boost the economy, but also start future athletes on the road to success and glory. Nationally, the government have ring-fenced £65 million of the money for the programme. They have decided to promote competitive sports and improve the delivery of PE and sport in schools over two years. The money allocated for our school is £8000 for each year plus £5 per pupil. This means that Drapers Mills will be given approximately £10,200 during 2013-14 and 2014-15. Inter house sports competitions held in Key Stage 2 in order to improve the competitive nature of sport at our school. Fair play is always strongly promoted too. We battle obesity in all year groups; this is an area that will be addressed at our school. Sports coaches will work closely, using a team teaching approach, with all year groups in order to ensure that a challenging and varied PE curriculum is being delivered. Sports training will take place during PDMs in order that all staff are trained with the necessary skills, knowledge and understanding in PE and Sport. 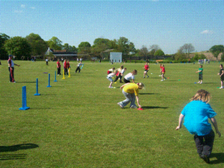 More emphasis is placed on preparing for competitions such as the ‘Kwik Cricket’ and ‘Racing Rounders’ tournaments. Children receive additional coaching in preparation for inter school tournaments. Sports equipment is always being updated and improved. We will be making our ‘Sports Day’ more competitive and more inclusive. Tools and analysis that will help us close the gap between all vulnerable groups in the field of PE and School Sport. Children in Key Stage 1 acquire and develop skills exploring basic skills, actions and ideas with increasing understanding. Children learn to travel with, send and receive a ball and other equipment in different ways. They develop these skills for simple net, striking/fielding and invasion-type games. They play simple, competitive net, striking/fielding and invasion-type games that they and others have made, using simple tactics for attacking and defending. Children consolidate their existing skills and gain new ones. They perform actions and skills with more consistent control and create and perform dances using a range of movement working with others. The spectrum of sports available widens and children in year 6 have the opportunity to go swimming. Having developed a very strong relationship with the Thanet Schools partnership, Drapers Mills is now offering a wide range of activities that can be enjoyed and participated in, at a competitive level. At present children can choose from football, rugby, hockey, handball, basketball, rounders, cricket, cross country running, speed stacking and dance which are provided after school. These clubs lead to the development of competitive teams which compete at over 25 festivals over the academic year. Drapers Mills has also invested lots of time and effort in developing club links within the community to promote a healthy lifestyle and create a holistic approach to the ‘school experience’. Please look on the 'club link' or ask at the school reception desk to see what clubs are on offer this term. Because of our links with the Thanet Schools Sports Partnership and local sports clubs, we have access to many sports not available through the National Curriculum. Children have the opportunity to experience archery, handball, basketball, golf, Taekwondo and Karate. We also have a fantastic relationship with Margate Football Club who through their playing for success scheme at the Margate Learning Zone offer fantastic opportunities for children to combine sport and classroom activities to improve their literacy and numeracy levels. In year 6, pupils are given the opportunity to participate in swimming as part of the national curriculum requirements. Classes take it in turns over the course of the year but receive over 10 hours of tuition. Non swimmers to advanced swimmers are catered for and the school’s goal is for all children to be able to swim 25m by the end of Key Stage 2.